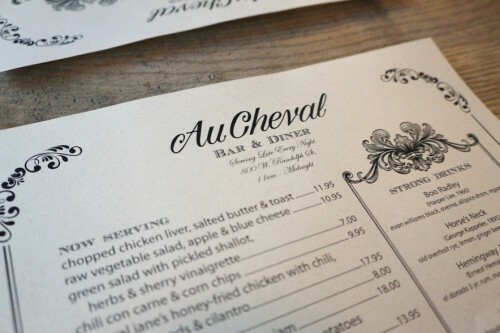 Located in the West Loop neighborhood of Chicago, Au Cheval is home to, what many consider, the best burger in America. So, don’t be surprised if you put your name on the wait list with an estimated wait time of 3+ hours. We took advantage of the fact that we were in Chicago on a Friday and dropped by at 10:45am, 15 minutes before they open. Surprise, surprise, there was already a line with 20 or so people ahead of us. Luckily the restaurant is much larger than I expected – I expected a tiny hole-in-the-wall with only 20-30 seats. 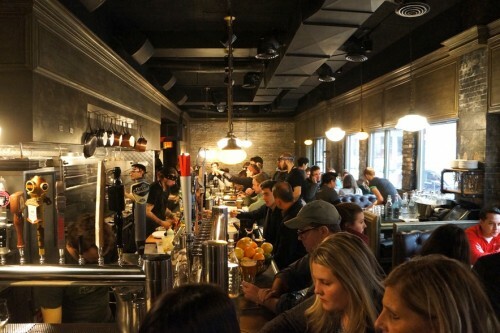 The dark interior features a long bar down a significant portion of the restaurant with the open kitchen right behind it. The rest of the space is filled with dark, chunky leather booths down the right side of the restaurant and tables at the very back. In France, if you see the term “au cheval” on a menu, it means it’ll come with a fried egg on top. According to their website, Au Cheval is “a diner-style bar and restaurant with a passion for eggs” so it’s no surprise that they have a “with eggs” section on their menu. There were so many tempting options including the crispy potato hash with duck heart gravy and the foie gras with scrambled eggs and toast but we were here for the burger. We each ordered a Single Cheeseburger ($11.95). The description is a little misleading as the ‘single’ actually consists of two patties while the double ($13.95) consists of three. They’ll ask if you want to add a fried egg and bacon to the burger but we wanted to try it in its original form. 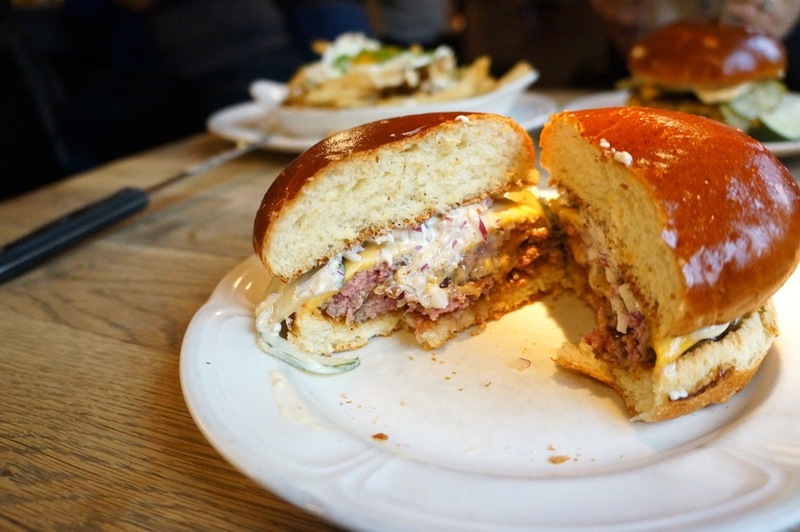 The burger came with two juicy beef patties, melted processed cheese, house-made pickles, chopped red onions and dijon-mayo. The toasted bun held up very well against the juicy patties and sauce. All in all, it was a damn good burger and we weren’t in the least bit disappointed. But the best burger in America? Hard to say! 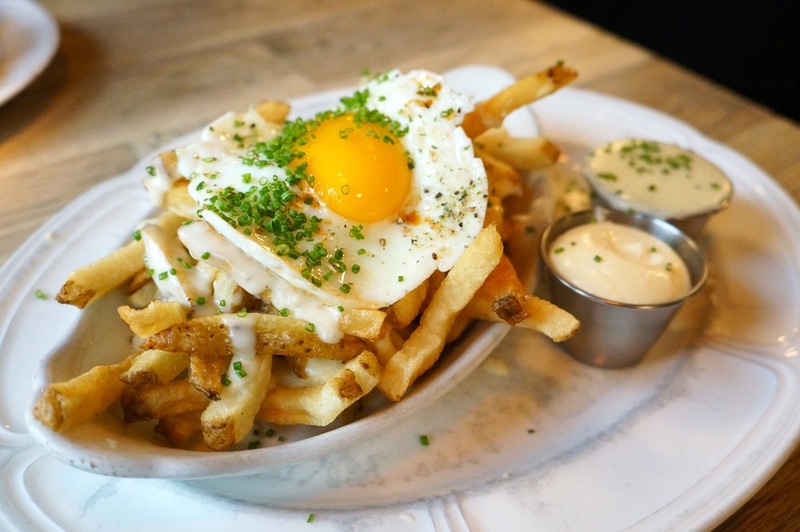 Since the burger doesn’t come with any sides, we supplemented our burgers with an order of Crispy Fries – with mornay sauce, garlic aioli & fried farm egg ($9.95). The hand-cut fries were of medium thickness and were, indeed, very crispy. Fried to perfection! Topped with a fried egg, we immediately broke into the yolk to spread the goodness onto the fries. We enjoyed the extra-garlicky aioli but could’ve done without the mornay sauce (a cheesy béchamel sauce). 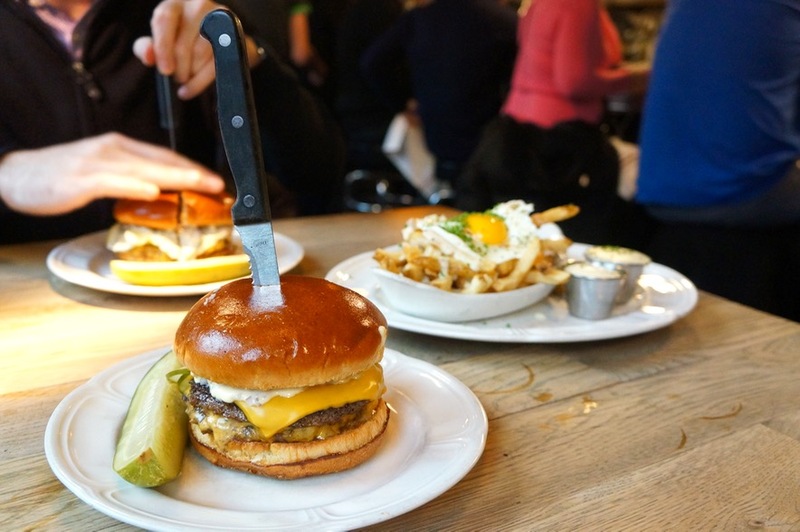 We came for the famous burger and we didn’t leave disappointed! Tip: beat the notoriously long waits by dropping by for lunch on a weekday.